Note: for the purposes of drink recipes on this site, "gin" refers to the London dry style. Other styles of gin will be specified (ie Old Tom). Whoever first thought of adding juniper berries to a base spirit was a genius. This was a pioneer of the first order, with cunning creativity and good taste. This person was also the inventor of gin. Gin originated with the Dutch, who called it genever. It was likely invented by an alchemist named Sylvius de Bouve in the early 17th century. Because distillation techniques back then were quite crude, the resulting spirit was harsh. In order the mask the harshness, herbs and botanicals were added and it was found that juniper berries were a superior additive. Juniper has been the main additive ever since, along with others such as citrus peel, angelica root, anise, coriander, cinnamon, and licorice root. The subtle differences in flavor between gins are a result of the guarded botanical recipes of the producers. When William of Orange invaded England and assumed the throne in 1688 in the aptly named Glorious Revolution, Dutch gin came with him. The English took to gin quite quickly, and it helped that the government did not require a license to produce gin. Also, imports of gin were heavily taxed, so domestic production flourished. By the mid-18th century, gin production was at five to six times that of beer. Gin was popular with the poor because it was a cheap, strong drink. A series of new taxes starting in 1736 led to riots in the streets. The onerous taxes were eventually rescinded and replaced with more gradual taxes and regulations that led to more government control over the production and distribution of gin. The free wheeling unlicensed days of the early 18th century were over in England. With the invention of the more efficient column still in 1832, the London Dry style that we are familiar with today came about. It is has a higher alcohol content than Dutch gin--usually 90 proof or more. The base spirit for gin can be made from a variety of cereal grains--wheat, rye, or barley. The grains are used to make a neutral base spirit to which flavoring is imparted from botanicals. There are two basic methods for instilling the flavors. Distilled gin The neutral base spirit is infused with botanicals and then distilled a second time. Botanical essences travel with the alcohol vapors and flavor the gin in a delicate manner. Compound gin The neutral base spirit is flavored with botanicals and there is no second distillation. Technically, compound gin is the same thing as flavored vodka. The Dutch tend to use barley to make the base spirit, and then will age the gin in oak barrels for up to three years. This results in a fuller body akin to whiskey. English gin is not aged, and is lighter and clear in color. Some gins are a combination such as Seagram's Extra Dry in the United States. Clear Seagram's gin sits on oak for three months and attains a straw color before it is bottled. Genever The original form of gin that was invented by the Dutch in the 16th century. The English call it Holland gin. It is made from malted barley or other grains (or in later years from molasses or sugar) and infused with juniper (hence the name) and other botanicals. Oude Genever ("old") is a bit sweet and quite fragrant while Jonge Genever ("young") is drier and more delicate. Genever can be aged in oak barrels which imparts some color to the liquid. This gin is often served very cold in the Netherlands and Belgium, and can be served with a cold lager as a chaser. London Dry The most common form of gin today is London Dry, which is a light, dry, clear spirit that is heartily flavored with juniper and other botanicals, fruits, and nuts. The gin you see on the shelf at the liquor store in England, the United States or Spain is most often London Dry gin. It is produced with a column still from a variety of cereal grains. Each producer has their own secret recipe of botanicals that impart the characteristic gin flavors and aromas to their products. London Dry gin is quite mixable, and is often found in mixed drink recipes. Old Tom Gin Old Tom straddles the gin spectrum between genever and London Dry (it is sometimes called the missing link). It is moderately sweet, but usually drier than genever and not as sweet as London Dry. It was popular in England in the 18th and 19th centuries but only a few distilleries still make it today. This was the original gin used in the Tom Collins. It got it's name from how it was dispensed in the 1700's. Gin houses would hang a plaque shaped like a tom cat on the outside wall. A patron or passerby would drop a penny in the cat's mouth and a bartender inside would dispense a shot of Old Tom Gin through a tube that led outside between the cat's paws. Due to hygienic reasons, I doubt we'll ever see anything like this again, though it does have a certain charm. Plymouth gin Plymouth gin is made only in the channel port of Plymouth, England. It is similar to the London Dry style, but is slightly sweeter on the front of the palate with a fuller body and a dry finish. It is made with the traditional gin botanicals, though no one botanical dominates the flavor. Today, this style of gin is made by only one distillery--the Black Friars Distillery. They make a standard proof and a navy proof (114 proof) version. Sloe gin The most popular and original flavored gin is sloe gin. Sloe gin is gin flavored with sloe berries and sugar. Cheaper brands will also use vodka. Better brands will steep sloe berries in quality gin for months and will not add any coloring or artificial flavors. Sloe gin is made between 30 and 60 proof, and is sweet with some balancing bitterness from the berries. It was popular during the Victorian era among the ladies. Today, you mostly see a pale attempt at sloe gin on the cordials shelf. You can still find quality if you look for the Plymouth or Gordon's brands. Gin is usually mixed with liquors, wines, or mixers. By itself, it can be a little rough, especially if it is not aged (most of it is not). 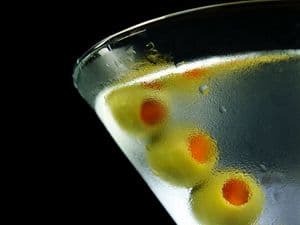 The most famous mixer for gin is vermouth in a dry Martini. This is a drink that was pervasive in bars around the world in the middle part of the last century. Unfortunately, (or fortunately depending on your taste) gin has been eclipsed by vodka in the Martini. Right after the Martini, you have the Gin and Tonic. This drink came about because the British needed something to help them gulp down their quinine, which they used to combat malaria in India and other colonies. They mixed it with gin and the rest is history. Tonic water today still contains quinine, although much less than the medicinal doses the British once used. I have found Schweppes or Canada Dry tonic water to be far superior to the cheaper brands. If you're using good gin, use good tonic. Each brand of gin has their own recipe of botanicals and resulting flavor and aroma profile. Tanqueray has a strong juniper and cassia bark flavor and not as much citrus. Bombay Sapphire is quite pungent with hints of liquorice and almonds. Hendrick's gin is softer with rose petals and cucumber added to the botanical mix. For a very good, inexpensive gin, try Barton gin. It has a very fresh botanical flavor, especially considering the price. As you can see, there is a huge variety of flavor in different brands of gin.